Not every one wants a big hair piece on there wedding day, thats why I love the subtle style of this Boho silver wedding head band. With a delicate design though out you will be so happy you finally found this piece. A part of our Halo Collection – a new collection of timeless wedding jewellery. 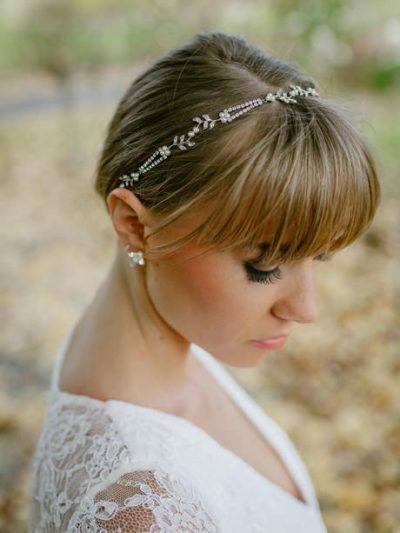 We have paired the Boho head band with our Eden wedding earrings, but I like the idea of bigger feature earrings to match like our Infinity wedding earrings. All our smaller wedding pieces come in our signature silk pink wedding box, so gorgeous if you are wanting to gift earrings or this silver wedding head band for your bridesmaids jewellery.